Wednesday 1/2: Riverwalk was extra quiet. Underpass was flooded so instead of walking to Moody, I drove down to Cronin’s and got a couple minutes there. Did get the coot and a few ducks. Thursday 1/3: Purgatory had most of the usual ducks, couldn’t find any Gadwall and only one wigeon today. The yellowthroat that I had back at the end of November turned up again at Forest Grove, not sure where that had been hiding for a month. Believe that’s at least the 5th individual in the county this winter and there were only six or so prior winter records in eBird. Friday 1/4: Started the year’s project (150+ in the SRV on work days) at the Wayland Community Gardens. The blackbird flock was around and a few redpolls were new for Wayland for me. Saturday 1/5: Tried the Cohasset bit of Norfolk, but still have no clue where to actually stop and scan the water. Gave up, drove through Hull (turkeys), then Nut Island (6 Razorbill), Wollaston Beach (turnstone), and Squantum (most of the sea ducks, both loons, etc). Sunday 1/6: Poked around the Watertown line a bit. Peregrine by Cookson, 5 Chipping Sparrows at Gore. Then did the first patch visit of the year. Started with a catbird, Winter Wren, and a few other things on the parkway. Continued onto the trails and had nothing other than a big flock of Red-wings. Looped the res after and had a Greater Scaup. Monday 1/7: Too windy to hit Heard Farm like I wanted, so looped Nine Acre (1 heron, 20 geese, 4 robins) up to Heard Pond (kingfisher on Pelham Island Rd). Tuesday 1/8: Was between the snow and the rain, so made it to Heard Farm. Just about the first bird out of the car was a Barred Owl. Further down, the chickadees seemed agitated (again). I walked a bit closer and a shrike flew by (commute #220!). Eagle by the pond, then the shrike perched up. Continued around and noticed a cormorant sitting, which was pretty far down on the list of expected birds today. Maybe only the second January record for the Sudbury River Valley. Too many dogs on the other side, but a big flock of blackbirds contained at least three species. Wednesday 12/26: Started at Horn Pond, which was pretty quiet. Continued to Silver Lake, which was birdless, then Martin’s Brook. The Tufted Duck was still present and a scaup was new there. Spent a good bit of time with them and finally got the wing views I wanted. Back to Silver Lake, which now had a bunch of gulls. Closest bird on the beach was an Iceland but the rest looked like Herring and Ring-billed. Barely had 20 minutes with them before an eagle flew over and they all took off. 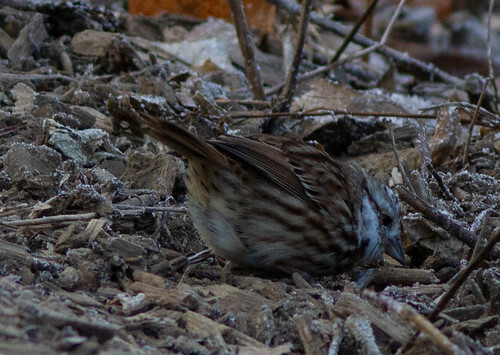 Thursday 12/27: Chipping Sparrows at Mt. Auburn, loon at Fresh Pond. Friday 12/28: Quick Spy Pond/Mystic Lake loop didn’t have anything exciting. Saturday 12/29: Went for the Painted Bunting. Got distant but good views after about an hour and a half, which was about as much as I could take. Continued to Chandler, Lost, and Hammond Ponds without anything of note. Sunday 12/30: Concord CBC. Pretty quiet. Barred Owl at Minuteman the best. Monday 12/31: Did a quick loop of Rock Meadow, Clay Pit, etc without anything before spending the rest of the day not holding down food. Tuesday 1/1: Felt enough better to go out for the morning. Nothing at any of the ponds but finally got the grosbeaks on the ground at Dunback along with the Marsh Wren (where’d that been? ), the Yellow-rump, and a few other things. Wednesday 12/19: BBN had a bunch of Rusty Blackbirds (count week!) and Red-wings plus Hermit Thrush and Barred Owl. Thursday 12/20: Did Gore. Got the redpolls (176 for the commute year list, probably the last one this year) but couldn’t get a good look at the junco flock. Not a whole lot else. Friday 12/21: Pond loop had an eagle at Hardy and that was about it. Saturday 12/22: Went to Torbet McDonald for the first time. Had hoped for the Nashville Warbler reported a couple days ago but no luck with that. Did have 2 redpolls, 2 grackles, and one strange Red-tail. Draw Seven was dead. Had at least 8 of the Razorbills continuing at Castle Island before it began to pour. Sunday 12/23: Made the trip up to Maine for the Great Black Hawk finally. Nice to see, but wasn’t exactly inspiring doing nothing but sitting in a random back yard. Checked a couple coastal spots before heading home, picked up six new birds for Maine overall. Monday 12/24: Started at Hardy which had a few ducks and a different eagle. Went a bit west from there. Hop Brook was pretty dead. Got cloudy and looked like flurries, so didn’t want to walk much from there. Hager Pond had the continuing shoveler, which was somehow a year bird, and a pair of Gadwall. Fort Meadow had a few ducks. School St was just pigeons and crows. Cambridge Res had another(?) eagle and more mergansers. Tuesday 12/25: Dunback was somewhat birdy but no grosbeaks. Did have 2 Yellow-rumps, the catbird, and a raven or two. Afternoon loop of the res had my first mockingbird of the year there and then a coyote by Potter pond. Wednesday 12/12: Nothing at all at the community farm. Ravens and the wigeon at Forest Grove. Thursday 12/13: Next to nothing on the river walk. Friday 12/14: Yellow-rump, Winter Wren, 3 Red-wings but no grosbeaks at Dunback. Saturday 12/15: Semi-CBC scouting. Started at along the river in Watertown, which was quiet. Prospect Hill had 2 Hermit Thrushes and a Barred Owl, but I don’t think we’re climbing the hill. Coot at Moody St was surprisingly Waltham #150 for the year. Normal ducks at the res. No grosbeaks again at Dunback, maybe another Barred. Did have a vole hide poorly enough to more or less pose. Sunday 12/16: CBC. Early owling was mostly a failure, one Barred called on its own and nothing responding. Dunback was birdy, we got the Evening Grosbeaks as a flyover and it appeared no one else saw them later in the day. Splitting here, I went to Lot 1 and had very little, then UMass where Snow Buntings came in. While we watched those, the sleet started and we bailed. I drove around a bit and saw nothing while waiting for the other group to finish before we headed to lunch. After lunch, we went to Gore (and Cookson) and had 3 redpolls, 3 Chipping Sparrows, and hundreds of starlings. We then did the river. Two Gadwall at Moody St joined the ducks I had yesterday, but little else. Even with the fair weather, we passed 50 species for the first time! Monday 12/17: Gadwall and Wigeon at Purgatory, which is a bit too far outside the circle for the wigeon to be count week. Tuesday 12/18: Too windy, so drove a big loop. Eagles at Saxonville Beach were the only things of note. Wednesday 12/5: Siskin and nothing else at Prospect Hill. Thursday 12/6: 4 Gadwall at Purgatory. Palm Warbler at Forest Grove. Friday 12/7: Absolutely nothing at Meriam’s. Saturday 12/8: Waited on Black Hawk news (which was a no until midafternoon), so headed to Earhart (quiet at Draw Seven and the greenway), then Belle Isle (Orange-crowned about it). Winthrop Greenway had a late Nashville, and thousands of scoters and gulls at Revere Beach (couldn’t find anything in the gulls though). Sunday 12/9: Leucistic Song Sparrow and a Red-wing about it at Horn Pond. Cormorants and an eagle at the lakes, 2 more eagles by Spy Pond. Lots of mergs all over including Clay Pit. Interestingly, Hardy and most of the res were frozen. Presuming I’m counting town year lists correctly, the mergs at Clay Pit were #1600 in my 17 town local area this year. Don’t think my original goal of 1700 is actually reachable without not going elsewhere. Monday 12/10: Not much at BBN. Sharpie at the top of Mackerel didn’t help. Winter Wren in the big marsh. Tuesday 12/11: GH Owl and the usual at Lot 1.